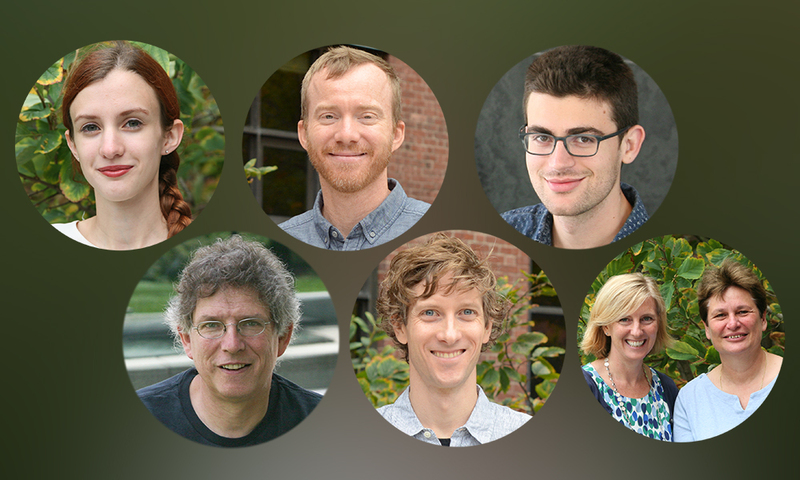 Every year, the MCB department announces the winners of awards that honor the creativity, experimental rigor, and collaborative spirit of Harvard students, postdocs, and faculty. This year’s honorees are making advances in neurobiology, drug metabolism, microbiology, and genetics. The Meselson Award, named for MCB faculty member Matthew Meselson, honors projects with exceptionally elegant experimental design. In a famous 1958 experiment, Meselson and his colleague Frank Stahl used a nitrogen isotope to distinguish parent and daughter strands in DNA duplication and in so doing established the fact that each duplicated double helix contains one original strand and one newly duplicated strand. The Meselson Award highlights experiments that continue that tradition of using innovative techniques to definitively establish biological principles. 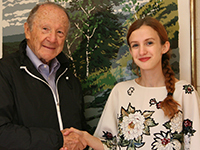 This year’s Meselson Award went to graduate student Georgia Squyres of the Ethan Garner lab for her work on cell division in bacteria. Her research focused on a protein called FtsZ, which is required for cytokinesis. In one experiment, Squyres and colleagues used fluorescent tags to label FtsZ in dividing bacteria and saw that FtsZ was “treadmilling” around the division site. In a second experiment, they manipulated the speed of FtsZ’s treadmilling motion to determine whether this motion was influencing cell division. They found that a cell wall synthesis protein called penicillin-binding protein 2B (Pbp2B) always moved in concert with FtsZ, and that the amount of cell wall synthesis during division scaled with FtsZ’s speed as well. Finally, they demonstrated that FtsZ’s treadmilling speed affected the overall duration of cytokinesis, demonstrating the importance of protein dynamics for cell division in bacteria. The Bjorkman-Strominger-Wiley Prize honors innovative collaborations between two Harvard labs. The award is named after MCB faculty members Jack Strominger and Don Wiley (who died tragically in 2001) and Pamela Bjørkman, who completed her Ph.D. research in Strominger’s lab and went on to become a professor at Caltech. The three collaborated frequently and made breakthroughs in MHC protein structure and t-cell recognition. 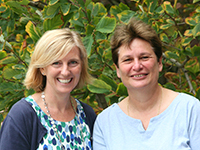 This year’s honorees, Catherine Dulac and Hopi Hoekstra have combined their expertises in behavioral neurobiology and evolutionary genomics respectively to identify candidate genes behind parental behavior. This line of research was led by a joint post-doc Andres Bendesky, who has since accepted a faculty offer at Columbia University, but the research is likely to continue.“They have a bunch of candidate loci now, and [this most recent] paper already shows that one of them is a known neurotransmitter, vasopressin peptide. …. this project […] highlights a synergy within MCB itself, and with our growing overlap with OEB,” one member of the selection committee noted in their comments. 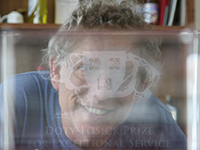 The Doty-Losick Award for Exceptional Service honors people who have made a lasting impact on the Harvard MCB community. The Doty-Losick Award is named after MCB department founding faculty member Paul Doty and current MCB professor Richard Losick, both of whom are noted mentors of new scientists. Murray himself served as department chair in the mid-2000s. Throughout his time at Harvard, Murray has proved to be an excellent recruiter and developer of new scientific talent, his colleagues say. His work has made Harvard a key player in the burgeoning subfield of systems biology and will likely shape the trajectory of the department for years to come. The Ernie Peralta Award, named after MCB faculty member Ernie Peralta, who passed away in 1999, recognizes third-year graduate students who have written outstanding dissertation proposals. 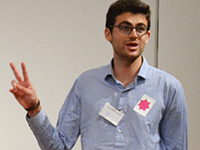 This year’s awardee is Vayu Maini Rekdal of the Balskus lab, who plans on investigating the gut microbiome’s interactions with a Parkinson’s drug called L-dopa. His dissertation research will explore the enzyme chemistry that allows some bacterial species to break down the drug. Faculty have noted Maini Rekdal’s infectious enthusiasm for science, as well as his independence and ability to formulate clear and medically relevant research questions about enzyme activity. “He is passionate about understanding the biochemical processes of human-associated microbes and their intersections with diet and human health; moreover, he had the foresight to begin acquiring the skills and experience he will need to achieve these goals prior to beginning graduate school,” one faculty member wrote in a nomination letter. As a graduate student, Maini Rekdal has already isolated microbes capable of surprising enzymatic feats, such as strains of Eggerthella lenta that can metabolize monoamine neurotransmitters (something few, if any, researchers had observed before) and an Enterococcus species that shows signs of being able to degrade L-dopa. “Overall, Vayu’s proposal and defense have set the stage for what I feel will be a remarkable thesis, showcasing the power of understanding gut microbial metabolic activities at a molecular level and demonstrating the potential of an interdisciplinary approach to microbiome research,” one faculty member wrote. This year’s departmental retreat also included a poster competition, where dozens of MCB community members present their research every year. 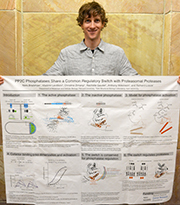 Research associate Niels Bradshaw of the Losick Lab took first place with his poster “A widespread family of serine/threonine phosphatases shares a common regulatory switch with proteasome proteases.” Bradshaw’s research investigated the structure and activity of a group of biomolecules called “phosphatases,” which play key roles in stress responses and other biological processes. Bradshaw and colleagues found that evidence that phosphatases likely share an evolutionary origin with proteasomal proteases in the form of a molecular “switch” that looks nearly identical in both protein families. Second prize in the poster competition went to research associate Adam Nelson of the Dulac Lab. 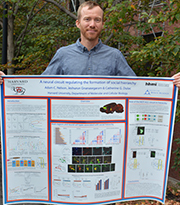 His poster, entitled “A neural circuit regulating social hierarchy dynamics,” focused on the neurobiology underpinning social hierarchies. Nelson and colleagues found that a region called the mediodorsal thalamus and the anterior cingulate cortex work together to help mice form social hierarchies.